Bucks County is a county located in the Commonwealth of Pennsylvania. As of the 2010 census, the population was 625,249, making it the fourth-most populous county in Pennsylvania and the 98th-most populous county in the United States. The county seat is Doylestown. The county is named after the English county of Buckinghamshire. Bucks County is included in the Philadelphia–Camden–Wilmington, PA–NJ–DE–MD Metropolitan Statistical Area, more commonly known as the "Delaware Valley". It is located immediately northeast of Philadelphia and forms part of the southern tip of the eastern state border. Bucks County is one of the three original counties created by colonial proprietor William Penn in 1682. Penn named the county after Buckinghamshire, the county where he lived in England. He built a country estate called Pennsbury Manor in Falls Township, Bucks County. General George Washington and his troops camped in Bucks County as they prepared to cross the Delaware River to take Trenton, New Jersey, by surprise on the morning of December 26, 1776. Their successful attack on Britain's Hessian forces was a turning point in the American War of Independence. The town of Washington Crossing, Pennsylvania and Washington Crossing Historic Park were named to commemorate the event. According to the U.S. Census Bureau, the county has a total area of 622 square miles (1,610 km2), of which 604 square miles (1,560 km2) is land and 18 square miles (47 km2) (2.8%) is water. The southern third of the county between Philadelphia and Trenton, New Jersey, often called Lower Bucks, resides in the Atlantic Coastal Plain, and is flat and near sea level, and the county's most populated and industrialized area. Bucks County shares a western border with Montgomery County, and also borders Philadelphia to the southwest, and Northampton and Lehigh Counties to the north. From north to south, it is linked to Warren, Hunterdon, Mercer and Burlington Counties in New Jersey by bridges. 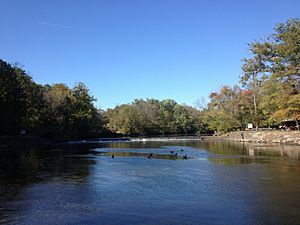 Tohickon Creek and Neshaminy Creek are the largest tributaries of the Delaware in Bucks County. Tohickon Creek empties into the river at Point Pleasant and Neshaminy at Croydon (Bristol Township). As of the 2010 census, there were 625,249 people. The population density was 1,034.7 people per square mile. The racial makeup of the county was 86.6% White non-Hispanic, 3.9% Black or African American, 0.3% Native American, 4.1% Asian (2.1% Indian, 1.1% Chinese, 0.7% Korean, 0.5% Filipino, 0.3% Vietnamese, 0.1% Japanese, 0.4% other Asian) 0.1% Pacific Islander, 1.7% were of two or more races, and 1.5% were of other races. 4.4% of the population were Hispanic or Latino of any race. As of the census of 2000, there were 218,725 households, and 160,981 families residing in the county. There were 225,498 housing units at an average density of 371 per square mile (143/km²). 20.1% were of German, 19.1% Irish, 14.0% Italian, 7.5% English and 5.9% Polish ancestry, according to Census 2000. There were 218,725 households, out of which 35.30% had children under the age of 18 living with them, 61.20% were married couples living together, 8.80% had a female householder with no husband present, and 26.40% were non-families. 21.50% of all households were made up of individuals and 8.10% had someone living alone who was 65 years of age or older. The average household size was 2.69 and the average family size was 3.17. The median income for a household in the county is $59,727, and the median income for a family is $68,727. Males had a median income of $46,587 versus $31,984 for females. The per capita income for the county was $27,430. About 3.10% of families and 4.50% of the population were below the poverty line, including 4.80% of those under age 18 and 5.50% of those age 65 or over. Like the rest of the Philadelphia region, Bucks County has experienced a rapid increase of immigrants since the 2000 census. Known for its very large and established Eastern European population, most notably the Russian community, but also for its Ukrainian and Polish communities, Bucks County is now seeing a rapid surge of other immigrant groups. A 2005 population estimate of Bucks showed that the Indian and Mexican populations had already doubled since 2000. Bucks County is one of only two counties in Pennsylvania where Mexicans are the largest Hispanic community, the other being Montgomery County. Bucks County also is home to large and very prominent Roman Catholic and Jewish populations. 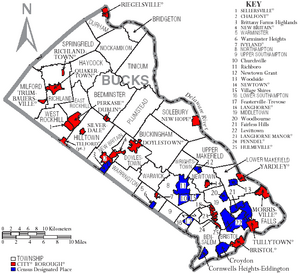 The 2013 population estimate of Bucks County Pennsylvania was 626,976. This ranked the county fourth in the state, well behind (more than 10%) the counties of Philadelphia with 1,553,165 (247% of Bucks), Allegheny with 1,231,527 (196%), Montgomery with 812,376 (130%), and well ahead of Delaware with 561,973 (89.6%). Growth began in the early 1950s, when William Levitt chose Bucks County for his second "Levittown". Levitt bought hundreds of acres of woodlands and farmland, and constructed 17,000 homes and dozens of schools, parks, libraries, and shopping centers. By the time the project ended, the population of Levittown had swelled to almost 74,000 residents. At the time, only whites could buy homes. This rule however, was soon overturned. Other planned developments included Croydon and Fairless Hills. This rapid sprawl continued until the mid-1960s. Many artists and writers based in New York City have called Bucks County home, settling mainly in the small stretch between Doylestown and New Hope and along the Delaware River. Notable residents have included Margaret Mead, Pearl S. Buck, Oscar Hammerstein, II, Stephen Sondheim, Charlie Parker, Moss Hart, George S. Kaufman, James Michener, Dorothy Parker, S. J. Perelman, Stan and Jan Berenstain, Daniel Garber, Alfred Bester, Annie Haslam, and Jean Toomer. Bucks County has been the home of writer/musician James McBride, Academy Award-winning film composer Joe Renzetti, musician Gene Ween of Ween, painter Christopher Wajda, photographer Michael Barone, and furniture designer George Nakashima. James Gould Cozzens lived in Lambertville, New Jersey, just across the river from Bucks County, and used Doylestown as the model for the setting of two novels; he is considered a Bucks County artist. The county boasts many local theater companies, including the long-established and recently reopened Bucks County Playhouse in New Hope, Town and Country Players in Buckingham, ActorsNET in Morrisville, and the Bristol Riverside Theatre, a professional Equity theater in Bristol. The Bucks County Symphony, founded in 1953, performs in Doylestown throughout the year. Alecia Moore, more commonly known as Pink, was born in Doylestown, as was motion picture writer and director Stefan Avalos. Three American Idol contestants live in Bucks County: Justin Guarini, who was born in Atlanta, but moved to Bucks County; Jordan White, who was born in Cranford, New Jersey and moved to Bucks County, and Anthony Fedorov, who was born in Ukraine and was from Trevose, in Lower Southampton Township. Singer/actress Irene Molloy and classical tenor David Gordon were born in Doylestown. Musician Asher Roth was born in Morrisville. The Tony Award-winning Broadway play Vanya and Sonia and Masha and Spike is set in the county. M. Night Shyamalan's 2002 film Signs, starring Mel Gibson, was filmed and takes place in Bucks County. The town scenes were filmed on State Street in Newtown Borough, and the drugstore scene was filmed at Burns' Pharmacy on Pennsylvania Avenue in Morrisville. The house was built on farmland privately owned and leased to Delaware Valley College in Doylestown Township. A stage set for some interior shots was created in a warehouse on State Road in Bensalem Township. Shyamalan's film Lady in the Water was shot across the street from the Bloomsdale section of Bristol Township. In addition, Shyamalan's 2008 film, The Happening, was filmed in Upper Bucks County, including Plumsteadville. With the exception of the footage filmed in the New Jersey Pine Barrens, all of The Last Broadcast was shot in Bucks County (though the name was changed). The film Law Abiding Citizen, starring Gerard Butler and Jamie Foxx, was filmed partially in New Hope. The NBC pilot episode for Outlaw, starring Jimmy Smits, filmed in the Andalusia section of Bensalem Township March 22–23, 2010. The feature film The Discoverers was filmed in a variety of locations in Bucks County, including Croydon, Bristol, Newtown, New Hope, and Tyler State Park. The Central Bucks West football team was followed during the 1999 season for the documentary The Last Game. It was directed by T. Patrick Murray and Alex Weinress. The County Fair scene in Charlotte's Web was filmed at the Southampton Days fair in Southampton, Bucks County. The majority of the independent Titanic film The Last Signals by Tom Lynskey was filmed in Bucks County. The 1942 film George Washington Slept Here was set chiefly in Bucks County, although most of the filming took place in the studio. Safe, starring Jason Statham, filmed at the Parx Casino and Racing in Bensalem Township. Bucks County has been mentioned multiple times on the popular Freeform TV series Pretty Little Liars. Bucks County Parks and Recreation operates an 18-bed youth hostel in the Nockamixon State Park Weisel estate. The hostel is part of Hostelling International USA. Washington Crossing Historic Park, a 500 acres (200 ha) site operated by the Pennsylvania Historical and Museum Commission, is part of Washington's Crossing, a U.S. National Historic Landmark area. The park is headquartered in the village of Washington Crossing located in Upper Makefield Township. It marks the location of where George Washington crossed the Delaware River during the American Revolutionary War. Sterling Aviation Heliport, privately owned and public heliport and helicopter repair facility located in Croydon, PA next to Neshaminy State Park. The population ranking of the following table is based on the 2010 census of Bucks County. Bucks County is home to a number of covered bridges, 10 of which are still open to highway traffic and two others (situated in parks) are open to non-vehicular traffic. Shown here is the Schofield Ford Covered Bridge over the Neshaminy Creek in Tyler State Park. Bucks County, Pennsylvania Facts for Kids. Kiddle Encyclopedia.